Saucer Terracotta Ø 15 cm curved rim, for 1 litre sold per piece, net = 50 pcs. Saucer Terracotta Ø 17 cm curved rim, for 2 litre sold per piece, net = 50 pcs. 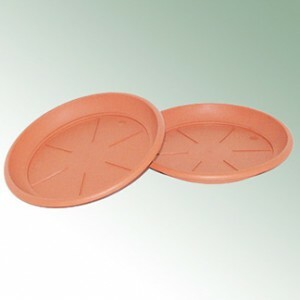 Saucer Terracotta Ø 20 cm curved rim, for 3/4/7 litre sold per piece, net = 50 pcs. Saucer Terracotta Ø 23 cm curved rim, for 5/6/10 litre sold per piece, net = 50 pcs. Saucer Terracotta Ø 27 cm curved rim, for 8/10/15 litre sold per piece, net = 50 pcs. Saucer Terracotta Ø 33 cm curved rim, f.12/15/25/33litre sold per piece, net = 50 pcs. Saucer Terracotta Ø 39 cm curved rim, for 20/26/46 litre sold per piece, net = 50 pcs. Saucer Terracotta Ø 44 cm curved rim, for 40/70 litre sold per piece, net = 50 pcs. Saucer Terracotta Ø 58 cm curved rim, for 60/120 litre sold per piece, net = 25 pcs.